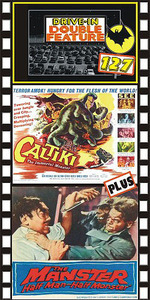 CALTIKI, THE IMMORTAL MONSTER (1959) John Merivale, Didi Sullivan, Gerard Herter, Daniela Rocca, directed by Riccardo Freda. A large, living radioactive mass is found in a subterranean pool near Mayan ruins. The monster is killed, but fragments are taken back to civilization where they begin to grow, eventually becoming another giant murdering blob! The scene where Caltiki rises out of the subterranean pool is quite memorable. A very cool movie. Highly recommended. 16mm. Plus: THE MANSTER (1959, aka THE SPLIT) Peter Dyneley, Jane Hylton. The chilling tale of a reporter injected with a strange serum by a mad scientist. He finds himself slowly transforming into a horrible, two-headed monster. The 'eye coming out of his shoulder' scene is a gem. An all English-speaking cast, not dubbed. One of our sentimental favorites. Recommended. 35mm.